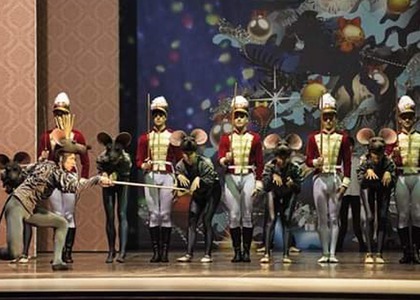 The Bucharest National Opera House opens the winter holiday season with a new production of The Nutcracker ballet by Pyotr Ilyich Tchaikovsky. As we all know, the story of The Nutcracker takes place on Christmas Eve. It is a story for children, about their fantasy world, with toys, dreams, and magical heroes that come to life. Oleg Danovski was chosen as director and choreographer for this production, which will be based on his father's original production from 1984. "I followed the choreography as closely as I could. I am aware that any collaboration with a new production designer brings new, fresh elements, which we hope to combine with the original production. Generally, I think we accomplished that. I worked with great pleasure with this new, young team. This show is for everyone, no matter their age, because each individual can see it differently. I think we managed to offer a wide-ranging show... it isn't solely about ballet, ballet, ballet. Because ballet is performance art, the theatrical is also emphasized here. We also offer real magic. We successfully combined projections with scenic backdrops. So there's a lot to see!" "A nice show, well performed, but I am wondering what Mr. Danovski's son contributed with, because the choreography belongs to master Danovski, the pas de deux at the end is very classical, traditional...anyway, he was kind enough to bring his father's show to the Bucharest National Opera House. A beautiful show, well performed, costumes, the scenic backdrops...I liked it!"